This song is running through my head as Ed and I wait for a glimpse of the only Gibb brother still alive – Barry. To be honest, and no disrespect to Robin or Maurice, or Andy for that matter – Barry is my favorite. Ed seems to be okay with that because, let’s face it, I’ve never even met Barry. Today, as Ed and wait like teenagers, standing for 4 hours in one spot, hoping for a glimpse, and perhaps an actual meet and greet, it is clear that we are both fans. 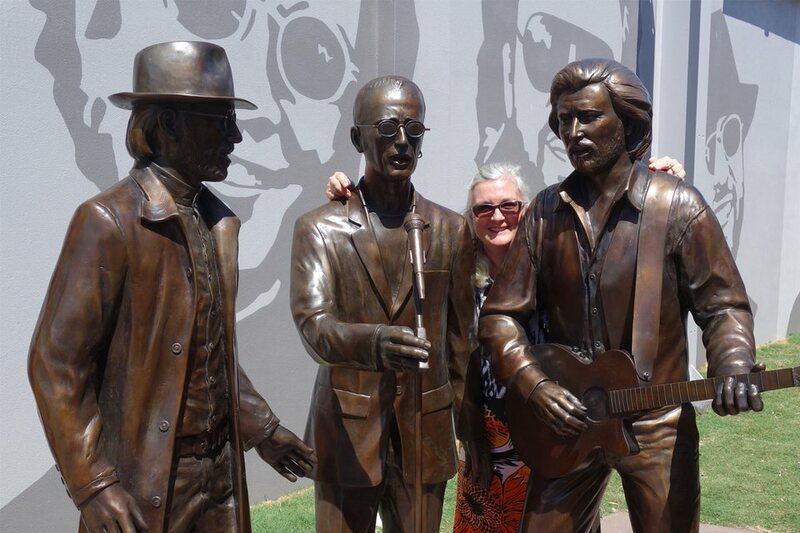 We are in Redcliffe to witness the unveiling of the second phase of Bee Gees Way – an outdoor tribute to the Bee Gees. 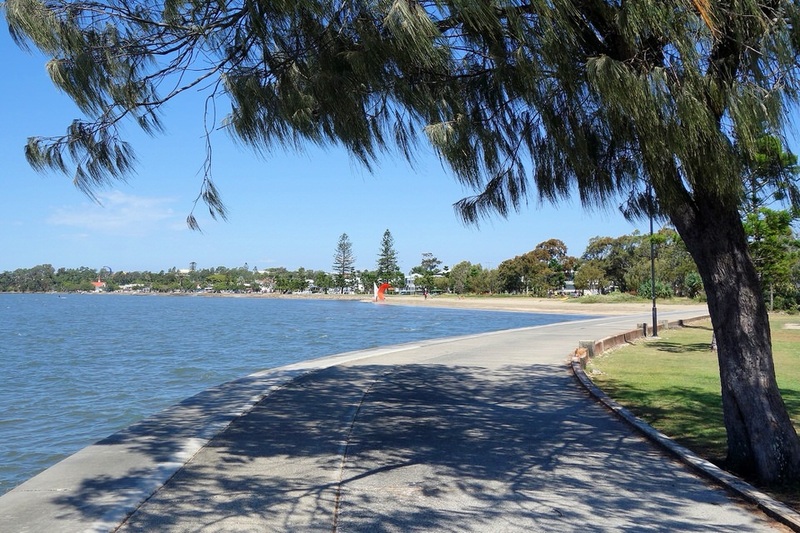 Redcliffe, a relatively short drive from our Bulimba home, is where the Gibb brothers grew up after their parents arrived in Australia, from England. This is where the musical talents of the Gibb brothers were discovered and the Bee Gees came into existence. The boys were not model teenagers and the opportunity to pursue a music career probably saved them from a life of crime. They are/were brilliantly talented but I won’t go into all of their significant accomplishments here, other than to say that their music has had a special place in our hearts. 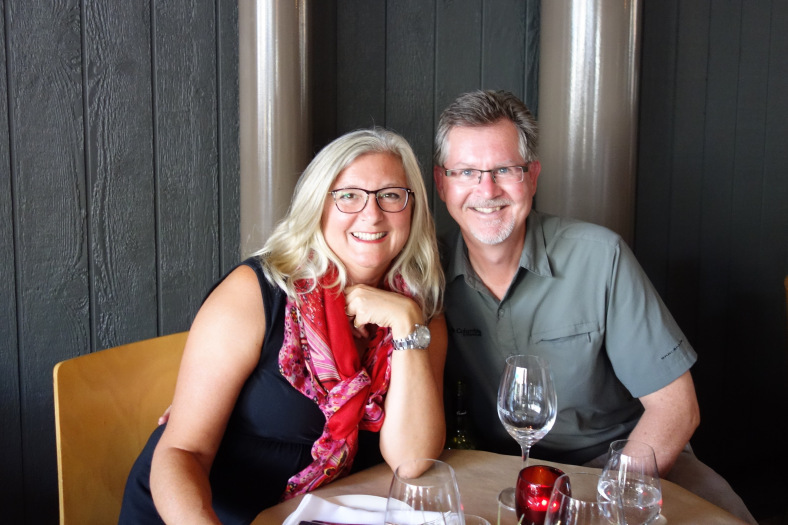 The songs of the Bee Gees evoke emotions within us as they remind us of our courtship and married life. As it turned out, our prime location was a bit of a dud. Barry started his speech from the platform at the far end of the road away from the VIP tent and unveiling site. We watched on the screen set up in the VIP tent as Barry gave a short speech and sang one of his songs before leaving the stage to head our way for the grand unveiling. Barry enjoys talking to his fans and it seems to us that he must personally greet every single person along the way who reaches out for him. If only we had known, we could have chosen a spot along the barricades. As it was, by the time Barry reached the VIP tent, he is being herded along quickly by his handlers. He waved in our general direction and promised to get back to us, but we know how unlikely that would be. We did our best to get a few pictures. We watch Barry on the screen while waiting for him to make a live appearance. He is inundated with fans when he arrives. The unveiling of Bee Gees Way. Ed and I have visited the Bee Gees Way previously, and because of the crowd on this day, we return the next weekend to take some more pictures. 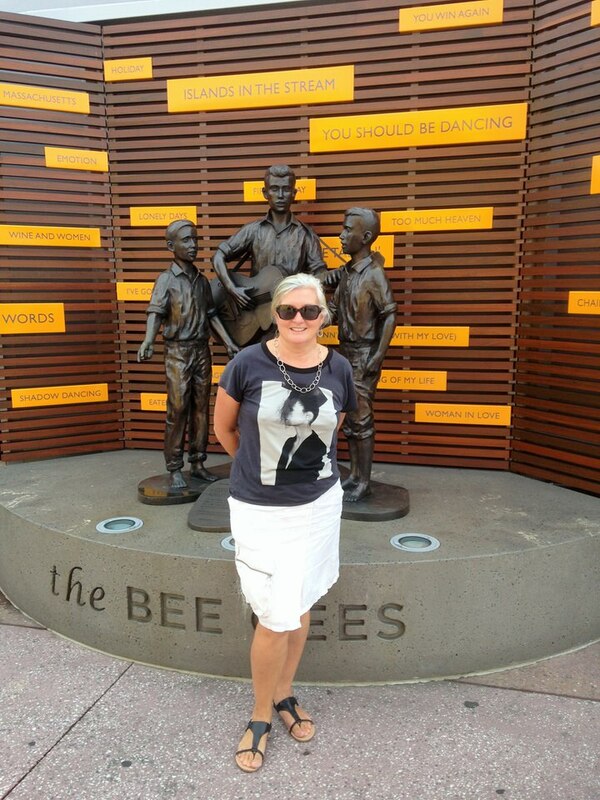 Here are some pictures of Bee Gees Way. 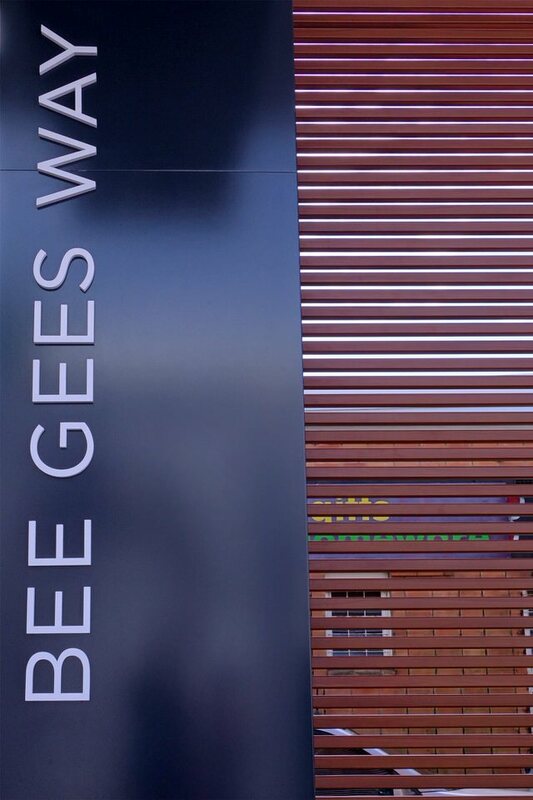 Bee Gees Way is a block long walkway in tribute to the Bee Gees. Wall murals along one side and commemorative pictures along the other, with colorful shelter from the sun and music videos playing from a large screen TV. 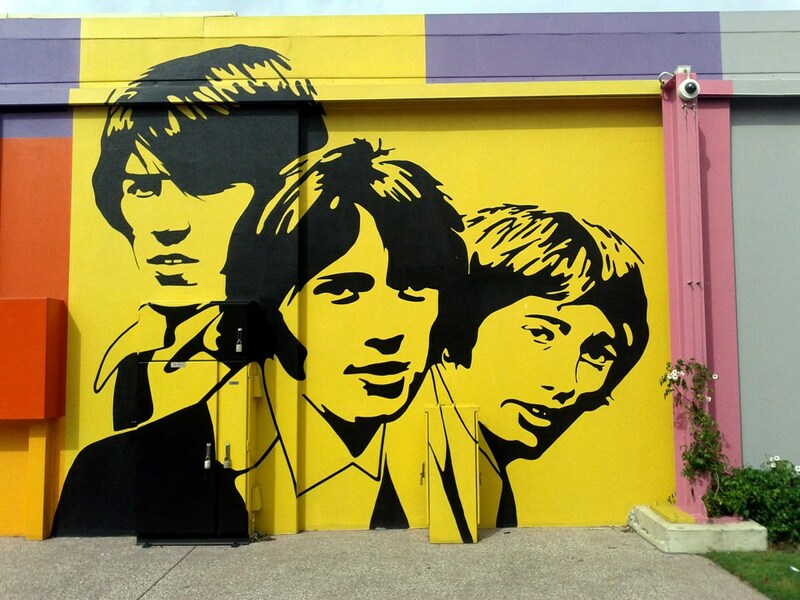 Three of the four murals are memorials to Robin, Maurice, and Andy (RIP) – Barry’s picture remains without tribute for the moment. 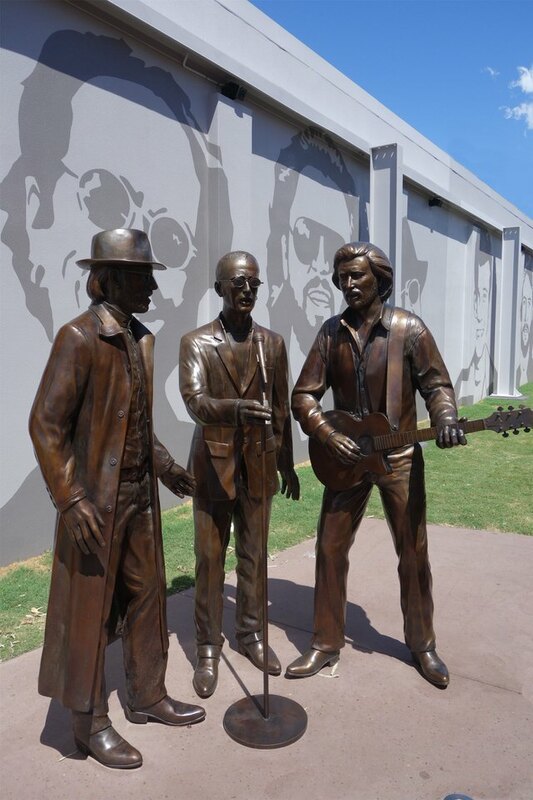 This past week, a larger statue of older Bee Gees was unveiled. I’m pretty sure that they made these guys a little larger than life so that people like me wouldn’t plant kisses on their bronze lips. As we leave Bee Gee Way, you can glimpse the bright modern wind sock circles on Redcliffe Parade. We have visited on a Sunday morning and there is a great market set up on this main street. 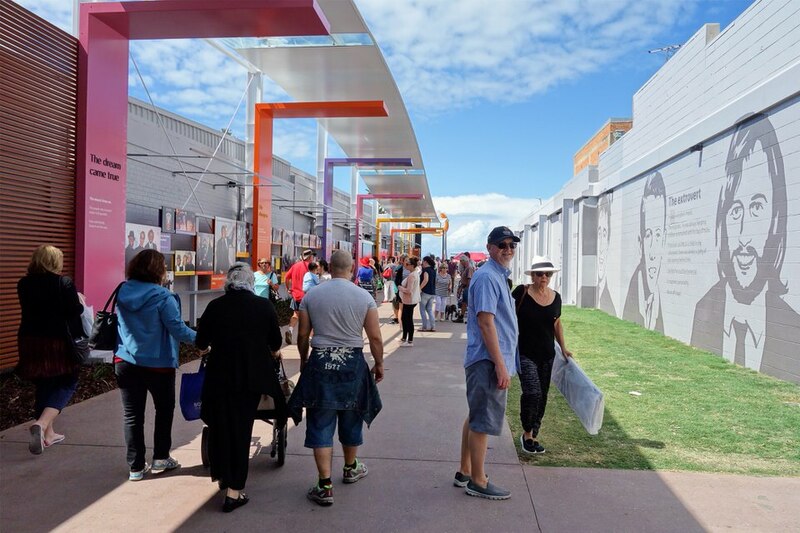 Redcliffe Sunday market on Redcliffe Parade. 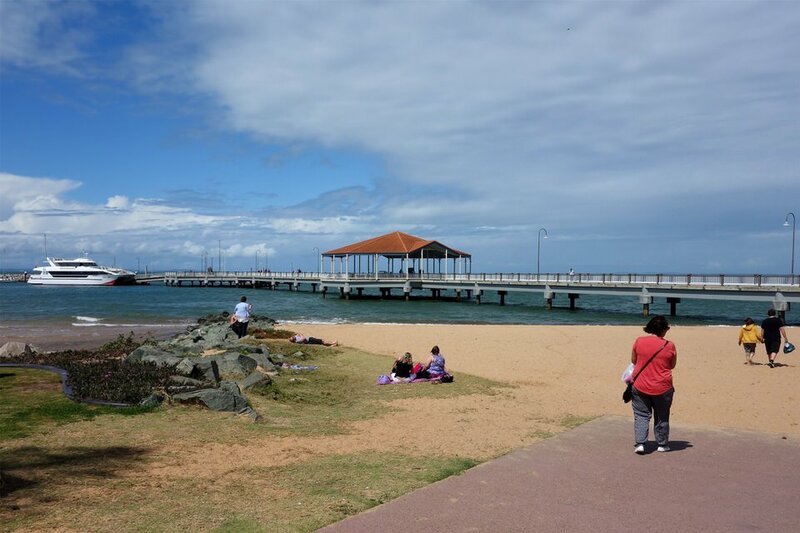 After enjoying the market on this sunny, albeit windy Spring morning we explore the jetty and surrounds of this lovely seaside town. 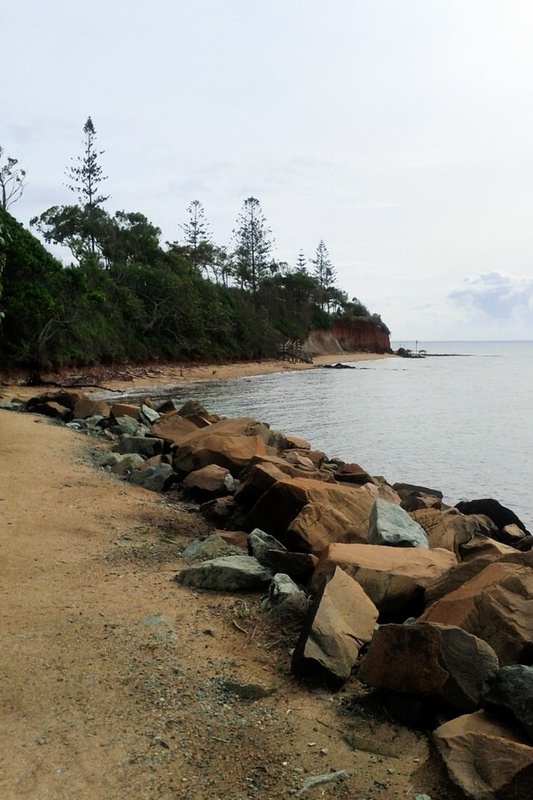 Today we can see across Moreton Bay to the island. Moreton Island is the third largest sand island in the world and popular tourist destination. Whale watching boats head out from the jetty, too. 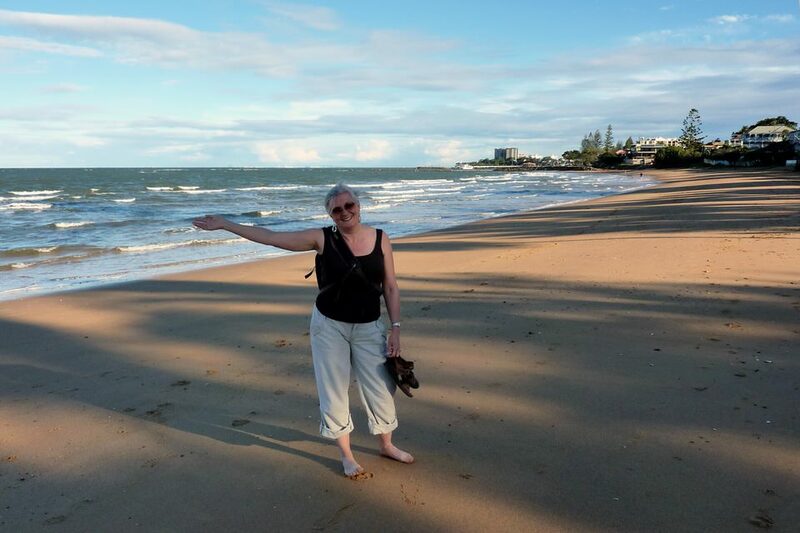 Slightly south of the pristine waters and sandy beaches of the Sunshine Coast; Redcliffe, Scarborough, and Sandgate all have distinctive shoreline and lovely wide walking paths to walk along and enjoy the ocean breezes, the birds, the waves and the occasional sandy patch for a beach. Frequent high winds with relatively shallow waters also make this a great place to enjoy windy water sports such as kite surfing. I hope that you have enjoyed this little seaside pictoral and ode to the Bee Gees. This entry was posted in Along the Coastline and tagged Bee Gees, Bee Gees Way, Redcliffe, Sandgate, Scarborough, shoreline birds. Bookmark the permalink.